Robot Launch 2014 is the first global online startup competition for robotics, and as the deadline for first round entrants approaches (11pm PDT on March 30) we’re excited to see just where in the world all the robot startups are coming from! There are already more than 40 entrants representing 18 different countries. The US needs to look over its shoulder as Europe and Australia are very well represented. And while the competition is being run in English, many entries are from non-English-speaking countries, giving a real global reach to our first robot startup competition. What sort of robots will come from such diverse backgrounds? That’s something we look forward to finding out when the judging starts on March 31, and we’ll post more in depth coverage of the semifinalist startups to Robohub. We can already see that there is a range in verticals, with service robotics well represented alongside hobby, educational and industrial robotics. Robohub and Silicon Valley Robotics are joined by many exceptional mentors and judges for this competition and we’d like to thank: Indiegogo, WilmerHale, Grishin Robotics, Bosch Ventures, Lemnos Labs, Robolution Capital, Luxr, Lux Capital, OATV, Khosla Ventures, Haxlr8r, and O’Reilly’s Solid conference. 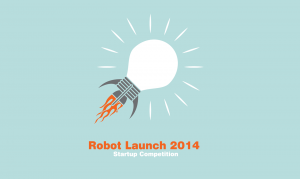 Robot Launch 2014 is open to any robot startup pre/partial Series A, from anywhere in the world. We’re looking for startups with prototypes and business models. But we’re also interested in any great robot startup idea … it could be a robot or an autonomous mobile manipulator … an appliance or connected device … or a sensor, actuator or even AI that makes robots better. We will be keeping everyone up-to-date and posting more information about the judges, competitors and awards right here, so stay tuned for more dedicated coverage on Robohub! What does it take to get from imagination to market?